Back of the Cereal Box: Goodbye, Mrs. Krabappel… But Hello, Lunchlady Doris? 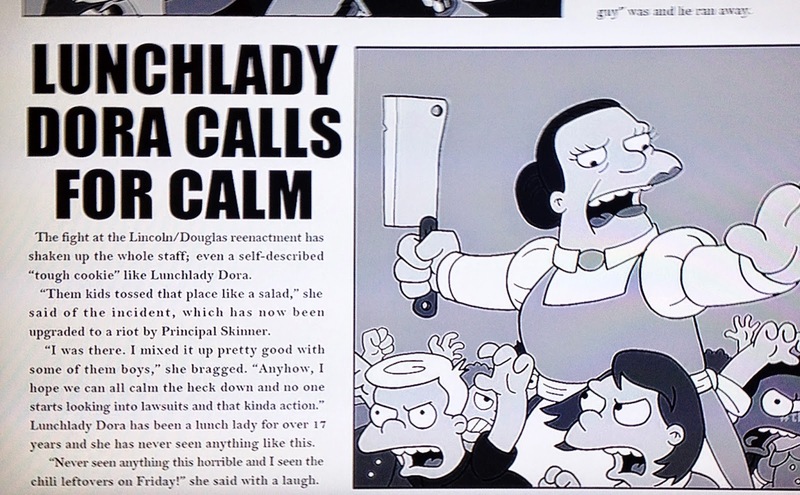 Goodbye, Mrs. Krabappel… But Hello, Lunchlady Doris? Every time I write about The Simpsons, I feel I need to preface the post with the admission that "Yeah, I still like The Simpsons, I still watch The Simpsons, it's occasionally quite good, and I still care about what happens on the show." I've watched for twenty-five years, and it's made a more significant impact on me than most people I've actually met. So there. It's for these reasons that I appreciated the show's farewell to Edna Krabappel. Following the real-life death of Marcia Wallace in October, it only seems right that the show should quietly retire the character that she'd voiced since the show's second episode. Ned Flanders's black armband interests me. If we're truly supposed to think that Edna has passed away, then that means he's been twice-widowed, which is a crueler fate than anyone might wish upon a guy who already has the misfortune of being Homer's next-door neighbor. That aside, I agree Mrs. Krabappel should go the way of Troy McClure and Lionel Hutz — gone for good, so random appearances in the background don't remind us of the decidedly un-funny death of the human behind the character. It's for the same reasons, however, that the episode was an awkward one to have a Krabappel tribute tacked onto it. You see, it featured Lunchlady Doris in a speaking role. As I've mentioned before on this blog, Doris Grau provided the voice of Lunchlady Doris until her death in 1995. But though the Simpsons character was named for Grau, who also worked as a script supervisor on the show. 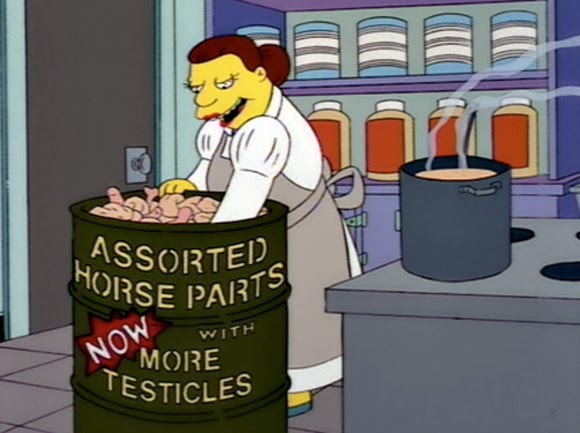 And while The Simpsons seemingly retired Lunchlady Doris as a speaking character, she returned to the show in 2006, now voiced by Tress MacNeille. And that seems odd to me. "more testicles mean more iron!" Of course, I didn't know Doris Grau, and I suppose it's possible that the people who made the decision to bring back Lunchlady Doris felt she'd be okay with her Simpsons counterpart continuing on without her. On my end, however, as a guy who's just been watching the show forever and ever, it's odd hearing her voice in new episodes, because I'm aware that original Doris died long ago. "Which is awkward. And not so funny," as I said last time. I still feel that way. EDIT: As of the March 30, 2014, the showrunners seem to have kinda-sorta found a way around the awkwardness: the identical-looking Lunchlady Dora. Either that or they just spelled her name wrong. Which would also be awkward. I figure the video isn't intended to be canonical, but I do have to wonder how they'll deal with Wallace's death. Not only would it mean an end to Bart's classroom scenes, but they just had her marry a quite prominent character. Were you watching Simpsons tonight? They just referred to the character as Lunchlady Dora. Maybe they saw the error of their ways and changed the name? I did. I was surprised. There are a few hits for "Lunchlady Dora" online, actually, but I feel like most people who follow the show would't have heard that phrase before. Maybe her name is Dora Doris or Doris Dora. Or the original was replaced with her identical cousin, as happened with Fat Tony.